One of the things I love about going to concerts is feeling like I’m a part of something with complete strangers. Coming together and bonding over the love of music. Singing our hearts out, being moved by the same thing. No talks of differences or strife. The connection over something that makes us and our hearts happy. I get so inspired that I find myself crying in moments like this. Yes, I’m that girl who can be seen weeping at the most ridiculous times. Luckily, my friends know me, they just know that ‘Shari is moved’ once again. So, it comes as no surprise that each year, as March 20th approaches, I become sentimental and excited. International Day of Happiness (Happiness Day) is almost here! This day was established on June 28, 2012, when UN resolution 66/281 was adopted by consensus of all 193 of the United Nations’ member states. The International Day of Happiness is celebrated around the world every March 20. This day is dedicated to spreading happiness, to being happy, to just lifting one another up. I mean, how could you not love and want to celebrate this day? Let’s be honest, I’m not going to pretend that we are all skipping through this world holding hands and taking turns on the rainbow slide and landing on our unicorns flying back up together to do it again. The truth is, there is some real discord happening in our world so days like this are days that need to be celebrated and shouted from the rooftops! As the UN states, “Happiness is a fundamental human right; happiness forever is a fundamental human goal.” The truth is, in whatever way you and I can do our part to help create a world in which there is more happiness for ALL, I believe it is our duty. This year’s theme is, Happiness for All, Forever and you are invited to take part in this day. Reflect and meditate on what makes you happy. Focus on the positive around you and spread your happy. Wish everyone a Happy International Day of Happiness. Find out how to host a happiness event, take the pledge, take part in global events, and more! Choose to be kind, loving, and respectful to all of humanity. THAT creates happiness that ripples out all over the world. Our greatest hope here at The Wellness Universe is that you find ways to live your happy in whatever and however that shows up for you. If it’s going to concerts to feel connected to others (and yes, even cry), or volunteering, hanging out with those you love, being kind to yourself, encouraging someone who needs it, or simply calling someone to say ‘I love you,’ spreading happiness is something we ALL can do and is something that will not only lift the spirits of the person you’re sharing it with but also lift you too! It’s a total win-win. Go ahead, I dare you. 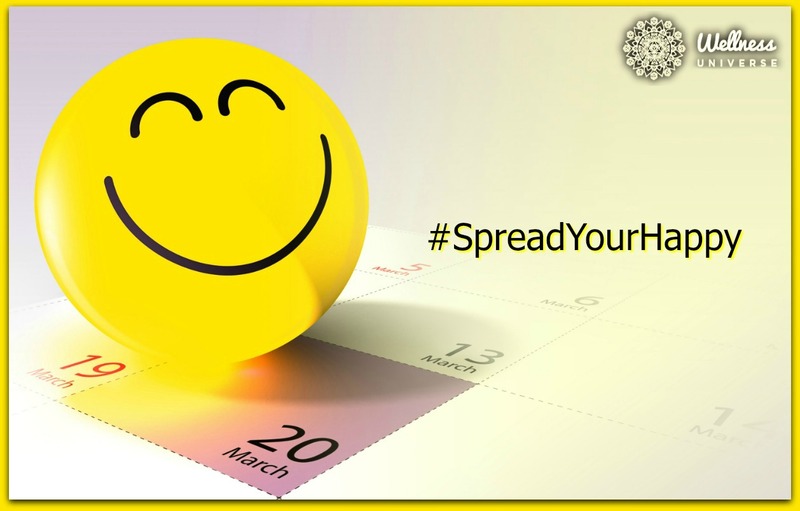 Spread Your happy! Psst… I love seeing you happy! If you need someone to talk to, reach out to me. How did this article make you feel? Leave your comments for Shari below. Please share this if you liked it. Thank you! I am a motivational speaker, author, life inspirer, and vlogger. I am the Co-Founder of The Wellness Universe and am presently working on several other life-changing projects with our company, Soul Ventures, that will bring forth positive change on this planet. Besides talking, I am equally passionate about travel. My idea of the perfect life is spent on planes, trains, and automobiles seeing the world. I have pep talks with myself daily. One of my biggest beliefs is that we all have a gift that is uniquely ours and it has been given to us so we can share it. It is rare that you will find me without a smile and it is rare that I'm not trying to make you smile. I presently live in Los Angeles with my boyfriend and our cat, Hershey. I would say I have a pretty simple but extraordinary life! Create A Life that is Oscar-Worthy!